iGetor data recovery software is a comprehensive and powerful data recovery software that specializes in restoration all causes lost files. Use iGetor data recovery software to recover missing MS word excel, photos, music, videos,pdf and other files from hard drive, external drive, usb flash drive, memory card,sd card and so on. 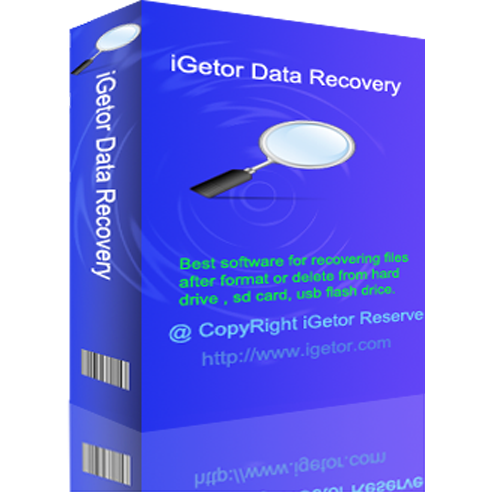 iGetor data recovery software restore function contains the logical layer, the logical layer recovery usually refers accidentally deleted, wrong clone, wrong format, partition loss, virus infection and other conditions. Support Windows 10 Windows XP, Windows 7, Windows 8, Windows Vista, Windows 2003, 2008, 2012. Support WD, Samsung, Sandisk, Toshiba, Seagate, HP, Dell,Lenovo,Maxtor,etc. Recover deleted files from hard drive,usb flash drive,sd card,etc. The format recovery function is used against data loss caused by user actions, such as formatting by mistake. When a hard disk or partition location and size remain unchanged, iGetor can quickly recover formatted files. Use "Full Scan" to recover files which can not be found with "undelete" and "unformat" and "recover partition"
For data recovery failures: accidentally deleted, formatted, file system damage, misuse loading system, Ghost partition on partition coverage and other data loss problems. Partition scan: mainly used for partition data is deleted, the file system cannot open the partition, partition formatting tips; issues such partitions are formatted, partition scan can be used to recover data. Don't rewrite any information to your storage devices. Don't do a disk check. Don't format the hard drive partition again. Don't recover data to your source hard drives directly. Don't store new data into the partition that you are going to recover. Don't do re-array when the disk array lost. How to recover files from Nokia Lumia 1020 smartphone SD Card ? How to recover files from Seagate Laptop Ultrathin HDD drive? How to recover files from WD Blue hard drive and Black solid-state hybrid drive? How to recover files from Toshiba Canvio Slim USB drive? How to recover files from Samsung 840 Evo solid-state drive ? Data recovery is through technical means, saved to desktop drives, portable hard drive, server hard drive, mobile hard disk, USB Flash Drive, digital memory card, Mp3 and more equipment, data lost on the rescue and recovery of technology. Copyright @ 2009 - 2013 mitusoft ltd. All Rights Reserved.